So you are 100 % certain that what you are reading in your favorite Bible version is a correct translation, and even if it isn’t, you are smart enough to pick the central tkeme regardless? You might want to think again! But then again , perhaps you are too smart to get fooled! LoL When you hear what Mike and Don uncovered this week you may just wanna rething that position! 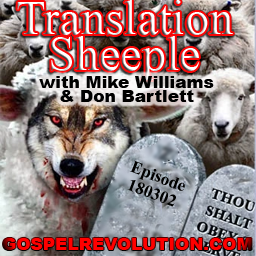 This weeks contributors include but are not limited to… James Gustafson, Karen Williams, Michael Turi and Jacki Barnard, Benny Hinn, Billy Graham, Danny Rouse, and topics include the good and faithful servant, mistranslations and more. omg that song actually physically made my stomach turn. Couldn’t wait for it to finish. OUCH!!!! So sorry Adrianne. Was that the last song on the podcast? What about it affected you? Hope you can help us improve your experience for the future. Again, really sorry Adrianne. LOL no need to be sorry. I am sorry I left you hanging. It was the song, Who at my door is standing, the message it gives just arrrrgggg. Dance children dance I have set you free loved that one, simple to the point and just thankfulness. Although all after the cross were born free I still give thanks for what He did to establish that. love (Aye Dree Anne) for pronunciation purposes lmao.